NAR has issued Call for Action asking Congress to support HR 2874 to reauthorize NFIP. NOMAR and the Louisiana Congressional delegation oppose this bill, as it has provisions that would be harmful to the Louisiana housing market. We are asking you to disregard or delete the email and/or text alert when you receive it. Stand with NOMAR and our Louisiana Congressmen and DO NOT take the Call for Action. Click here for more information. Forecast is on Tuesday, Oct. 10! Preregistration is closed, but walk-ins are welcome! Ticket prices will be $45 for members and $50 for non-members. This event has been approved for 4 hours of both agent and appraiser CE! Free parking is available in the West Road Parking Garage behind Holy Name of Jesus Church. Look for the yellow “Forecast Parking” sign on St. Charles. View the map here. MLS Matrix Basic I (Metairie) - "Providing Better Service Utilizing Matrix I" at 10 a.m. on Wednesday, June 21. Please see the online calendar to reschedule this class. NOMAR CE - Metairie - "2017 Broker Mandatory - Broker Responsibilty" at 9 a.m. on Thursday, June 22. We are working to reschedule the class with Burk Baker and will notify members when a date has been set. NRDS & ECOMMERCE ARE DOWN THIS WEEKEND. NRDS & Ecommerce are down for maintenance this weekend. IMS services will be inactive on Friday, April 21 at 4:55 p.m. and will be reactivated Monday, April 24 at 8:30 a.m.
You will still be able to access forms on our website. 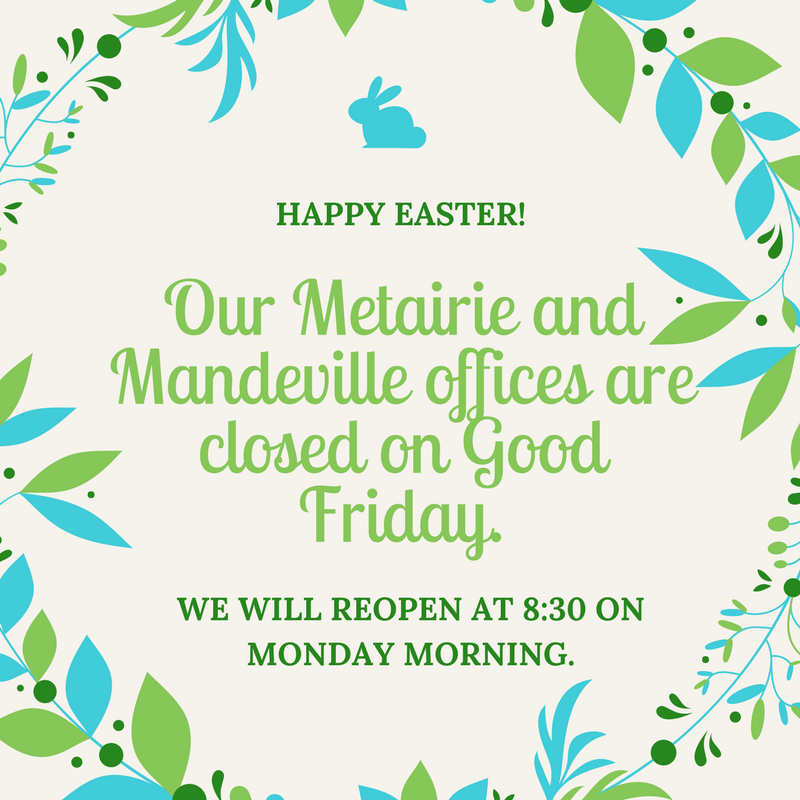 Our offices are closed on Friday, April 14 in observance of Good Friday. We will reopen at 8:30 a.m. on Monday morning. Happy Easter!